Epsom salt is one of those things I always keep on hand. 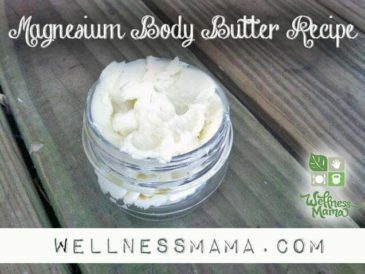 It is a good source of magnesium (here’s why we love magnesium) and has dozens of household, beauty, and health uses. Because of its many uses I often add a bag of epsom salt to my online orders and we keep it in almost every room of our house for different reasons. Don’t confuse epsom salt with regular table salt or Himalayan salt (which has many benefits as well). Epsom salt is a magnesium-based “salt” rather than a traditional sodium-based salt. It is chemically known as magnesium sulfate and is an easy and inexpensive source of magnesium. Research shows that many people lack this important mineral due to magnesium levels declining in our food and environment. 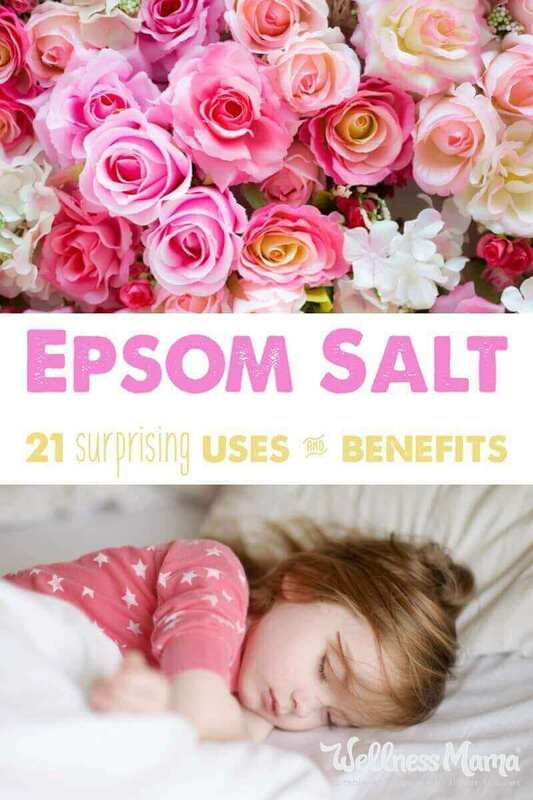 Using epsom salt around the house and in beauty treatments is one easy way to improve magnesium levels. Just be careful: as the labels on any epsom salt package will warn you, it is a potent laxative, so this isn’t a supplement you should take internally without a doctor’s recommendation. Instead, this mineral is best absorbed transdermally (through the skin). Epsom salt has been added to baths as a relaxing soak since it was first discovered at a salty spring in Epsom, England. The high magnesium content makes it a wonderfully relaxing soak. I’m a big fan of using epsom salts as part of my detox bath routine. I also usually add a little epsom salt to my kids’ baths to help them sleep. What to do: Add a cup of epsom salt to a warm bath and soak for 20 minutes. You can also add a drop or two of lavender essential oil, which adds a lovely scent and helps induce relaxation as well. This is an old trick I learned from an elderly relative and we use it all the time. With six kids who love to climb trees and run around barefoot, splinters are a fact of life. Unfortunately, the removal of these splinters used to cause a lot of heartache at our house. Now, I make a strong solution of warm water and epsom salt and let the splinter soak for about 10 minutes. This makes it so much easier to remove (and helps stop the pain too!). What to do: Dissolve 1/3 cup epsom salt in 1 cup of warm/hot water and stir until completely dissolved. Soak the affected finger/toe/body part with the splinter for at least 10 minutes and carefully remove the splinter with tweezers or a sewing needle. Also, use common sense: if the splinter is big, deep, a puncture wound, bleeding, or simply won’t come out, visit a doctor. Our feet are one of the most over-worked and under-appreciated parts of our bodies. On days that I hike, garden, or work outside for hours, it’s easy to end up with sore feet and legs, so I love to use this soothing and silkening (is that a word?) magnesium foot scrub. What to do: Find (and print) the full recipe here, but you basically mix up 1 cup of epsom salt or magnesium flakes with some carrier oil and a little castile soap to make a luxurious foot scrub. It also seems to help with cracked heels if you get those as well. Did I mention that magnesium can help firm the skin and exfoliate? I add a little epsom salt to my face wash or oil cleansing routine for a soothing and firming boost. What to do: I grind up epsom salt (in the blender or using a mortar and pestle) and add it to my face wash or oil cleansing oil as I massage it into my face. I find this works better than trying to add it to the face wash in the container. Once upon a time I got a bad case of the stomach flu and my body ached all over as it tried to fight it off. I noticed I had some Biofreeze on my counter. The package indicated that this was for “sore and achy muscles” so I decided to give it a try. Turns out, this super-strong muscle relief cream is not designed to be used on the entire body! Instead of achy muscle relief, I got whole-body chills for an hour. Not so fun! Now, I stick to epsom salt baths for body aches and sore muscles and it works like a charm! What to do: Add 2+ cups of epsom salt to a warm/hot bath and soak for 20+ minutes. 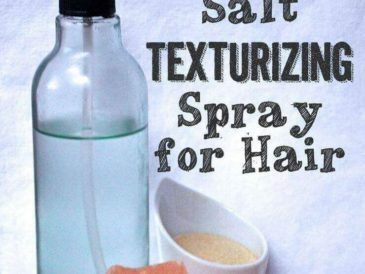 A hairstylist once used a texturizing salt spray on my hair and I loved the body and texture that resulted. I wasn’t willing to spend the $30+ it cost, so I started experimenting with DIY options. Now, I use my beach waves spray most days and combine it with my dry shampoo if I’m not washing my hair that day. What to do: Use this recipe to make a beach waves spray with magnesium. If using dry shampoo, use it first and comb/brush through hair before spraying with the salt spray. We use topical magnesium spray all the time but my kids don’t love the tingly skin feel they get after using it. (And I don’t love the dry skin that can sometimes result from direct use on the skin.) Years ago, I started making this soothing magnesium lotion to solve those problems. Now, this lotion is a daily staple in our house. What to do: Use this recipe to make your own soothing magnesium lotion. 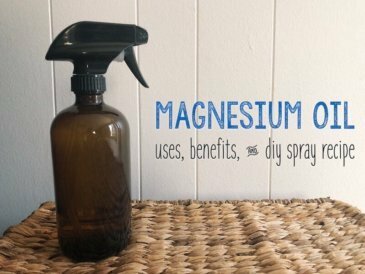 If you don’t want to try the DIY, there is also a great brand of pre-made magnesium lotion available here. When I was in 4-H years ago (more than I’d like to admit! ), we learned that epsom salt can be used to improve a vegetable garden. These days, I add 1 tablespoon per plant a couple times during the year and it helps plant growth, especially tomatoes. What to do: Sprinkle a tablespoon of epsom salt around the base of a plant after it has grown to at least 12 inches tall. 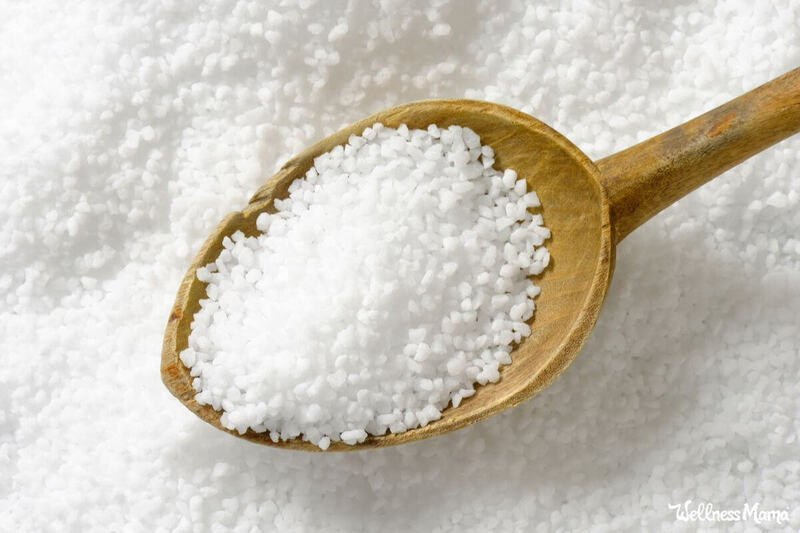 Epsom salt is a magnesium-rich alternative to regular salt in salt-scrub recipes. 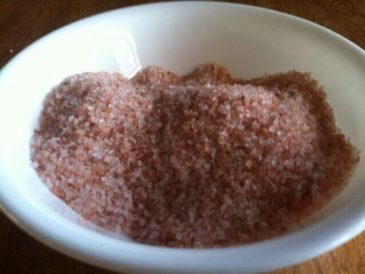 Salt scrubs are traditionally a mixture of salt and an oil like olive oil or almond oil. 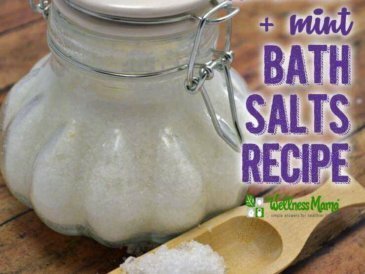 Epsom salt can easily be used in place of the salt in these recipes for an extra magnesium boost. What to do: Use epsom salt instead of salt in a recipe like this one. Or, just mix 1/2 cup epsom salt with 1/4 cup olive or almond oil and use as an exfoliating scrub in the shower. Want to clean your tile without a toxic chemical cleaner? Add some epsom salt to some liquid dish soap and scrub away. Just make sure to rinse well since the soap will be slippery! What to do: Mix equal parts liquid dish soap and epsom salt and scrub tile and grout with a brush. For a pre-made option, Bon Ami also works great on cleaning tile and grout without harmful chemicals. If you aren’t in the mood for a full bath but want the magnesium-boosting benefits of an epsom salt bath, just soak your feet instead! What to do: Add 1 cup of epsom salt to hot water for a concentrated foot soak. For scent, you can also add up to 5 drops of essential oil of choice. I explained above how I use magnesium as a texturizing spray for thicker hair. 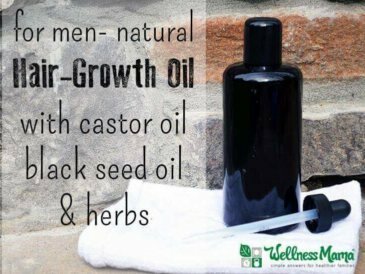 It can also be used in the shower to thicken and strengthen hair. I love to add epsom salt to a natural conditioner for a texturizing and strengthening boost for hair. What to do: Mix a natural conditioner (I use this one) with equal parts epsom salt and work into your hair. Leave on for up to 20 minutes. Rinse well and dry for thicker hair! This hair serum also helps thicken hair and I’ve been using castor oil for years to achieve thicker hair and eyelashes. What can magnesium not do? 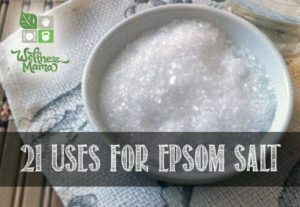 Epsom salt is also my go-to for relieving itchy skin from bug bites or other reactions. What to do: Dissolve a tablespoon of epsom salt in a cup of water and let it cool. Spritz on bug bites or itchy skin to help calm the itch. A drop of lavender right on a mosquito bite also helps calm the itch. Or add some lavender to the spray. I’m going to step onto a soap box for just a minute. I think the sun is beneficial in moderation and that in many cases, sunscreen may do more harm than good. That said, every source agrees that sunburn is harmful and we should make every effort to avoid it. For our family, we try to get moderate sun exposure daily, but never enough to burn or turn pink. On the rare occasion when we get too much sun (usually me … Irish skin), I make a soothing after sun spray. This is one of the on-label uses for epsom salt. Due to its high magnesium content, it is well known for its ability to relieve constipation. I’ve used it this way as part of a liver and gallbladder flush, but some people use it for the relief of occasional constipation. What to do: Follow the package directions for relief of occasional constipation, but check with a doctor first, especially if you have any health problems. House plants are great for cleaning indoor air and we love to keep them around. Just like garden plants, house plants love a magnesium boost once in a while. Add some epsom salt as part of a regular watering or fertilizing routine for more robust house plants. What to do: Sprinkle a little epsom salt on the soil in a house plant container or add a little epsom salt to the water when watering. A tablespoon is usually plenty for a month or two. Salt of any kind, including the epsom variety, is great for deterring slugs. If you’re already using salt in the garden to help improve the soil, this should help deter slugs as well. If not, consider sprinkling some salt around to keep the slugs away. What to do: Sprinkle epsom salt in or around gardens and other areas you don’t want slugs invading to keep them away. We can debate forever if a rose by another name would be as sweet, but one thing is for sure: roses love magnesium and adding a little to the soil around a rose bush helps increase growth and blooms. What to do: Sprinkle a tablespoon of epsom salt around a rose bush and water for faster growth. Can be done once a month. There is quite a bit of evidence that magnesium may help headaches and even migraines when used regularly. Some sources even think that magnesium deficiency may increase the chance of headaches. I’ve noticed that when I consume magnesium or use it transdermally, I also don’t seem to get headaches. And my husband swears that the best hangover cure is a long swim in the ocean, which is much higher in magnesium than lakes or swimming pools. What to do: Use any of the methods above to get more magnesium. I also find that magnesium spray and magnesium lotion are especially helpful for headache relief. What parent doesn’t want kids who want to sleep at bedtime? I know I certainly do! Part of our bedtime routine is using magnesium in some way. This may be a bath, lotion, or spray, but it helps our kids fall asleep much quicker and stay asleep longer. Here are some other natural sleep remedies we use, and why we don’t have night lights in their rooms. What to do: Make an epsom salt bath or magnesium lotion massage part of the bedtime routine at your house. Magnesium in the soil helps improve plant growth. It can be added during the growing season but we see the best results when we mix it into the soil too. What to do: Add a bag or two of epsom salt to the soil and till in to replenish soil magnesium levels. I buy high quality epsom salt online, but you can probably find it in your local grocery or health food store. Just look for one that is USP certified and doesn’t have any added ingredients.